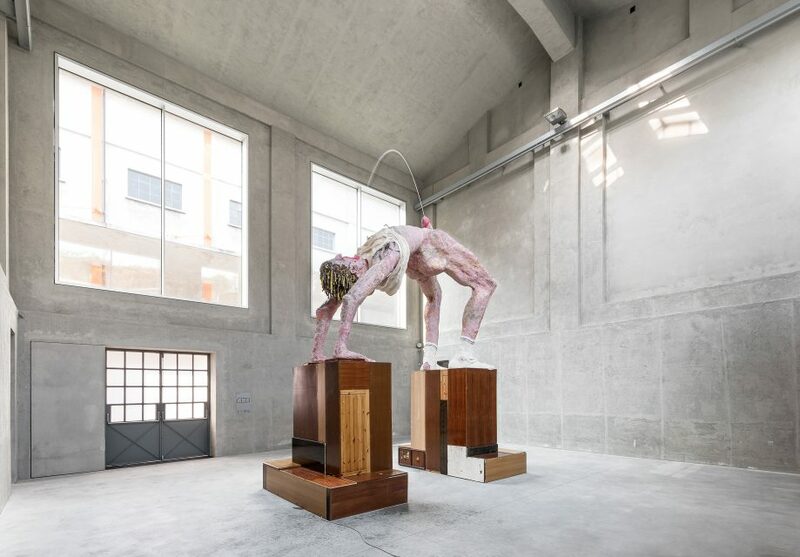 The Cisterna in the Fondazione Prada is currently the home of Austrian collective Gelitin. 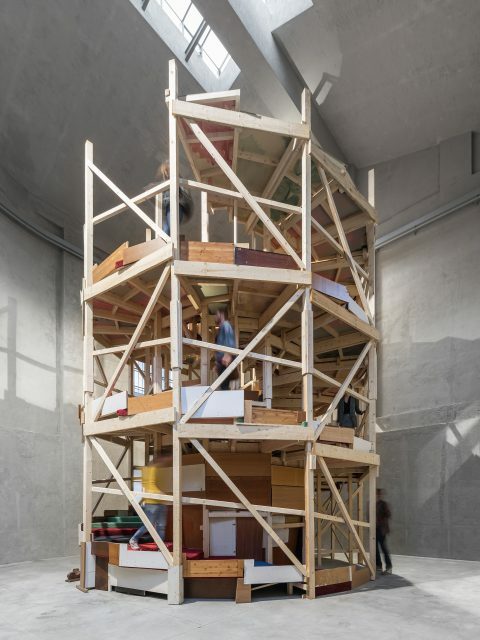 This is the third part of the Slight Agitation series, an exhibition project conceived by the Fondazione Prada Thought Council. The group was preceded by Slovenian artist Tobias Putrih and Swiss creator Pamela Rosenkranz, and will be followed by Brazil’s Laura Lima. Members Shumon Basar, Cédric Libert, Elvira Dyangani Ose and Dieter Roelstraete are presenting a project titled POKALYPSEA-APOKALYPSE-OKALYPSEAP. 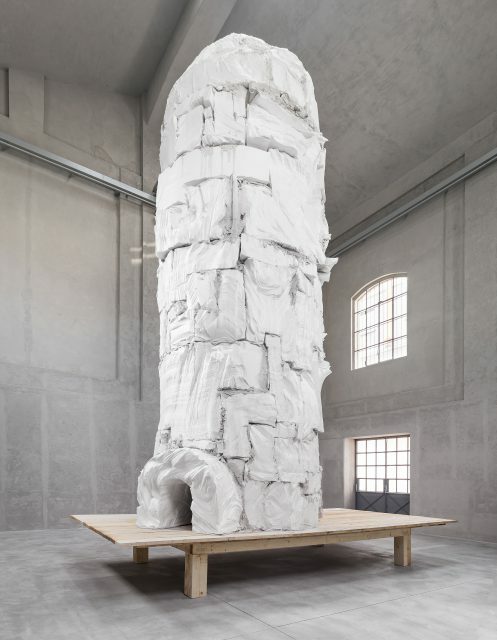 Within it, they use three large sculptures of classical architectural archetypes —the triumphal arch, the obelisk and the amphitheatre— to draw an arc from the insular and individual to the monumental and collective. Their Arc de Triomphe reproduces a male figure bending over backwards —their take on the Roman arch. For a phallic element, the quartet has incorporated a water fountain. Their obelisk, made up of polystyrene blocks, resembles an Inuit totem pole, while their take on the amphitheatre is a wooden upward spiral. Visitors can enter the latter and, as prescribed by the artists, smoke a cigarette in the center, so as to engage in a performative banality. “In the tripartite story of POKALYPSEA-APOKALYPSE- OKALYPSEAP the fundamental question is one that quite literally questions the fundaments of sculpture as given, for instance, in the traditionally three-fold way of matter’s manifestation in the known universe: solid (plasticine, styrofoam, wood), liquid (the triumphal arch’s well-aimed water jet), gas (cigarette smoke, the settling dust all around); or in the liquid logic of matter’s preferred paths of ‘transitioning’—freezing and melting; condensing and evaporating,” concluded Dieter Roelstraete.